The EZ DUZ IT can opener. The last one made in the USA. Durable construction--great performance. Made in an American Factory by American Workers. Says right on the package: "Save American Jobs!" If you have, or had, an old "SwingAway" can opener and desire a made in USA replacement...THIS IS IT! Actually this is the most patriotic packaging we've ever seen---really! Get a few: one for home, another for camping/ travel. Available in 3 colors: black, red, and blue. White is temporarily unavailable. IMPORTANT: Please note that newer versions of the can opener have a built in bottle opener. This bottle opener is pretty sharp so please be careful when removing your order and when handling opener in the kitchen. We will place a guard on the opener when shipping as an extra safeguard. *Black has slightly beefier handles (a little more leverage and easier to grip). Pretty much the same otherwise. 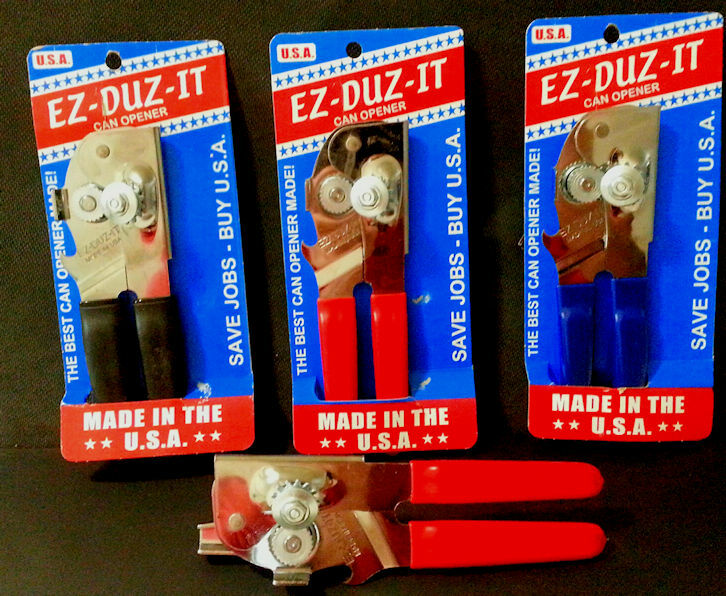 *The EZDuzIt is very similar to the old Swing-A-Way can opener (now imported), which is a familiar brand to many of us. 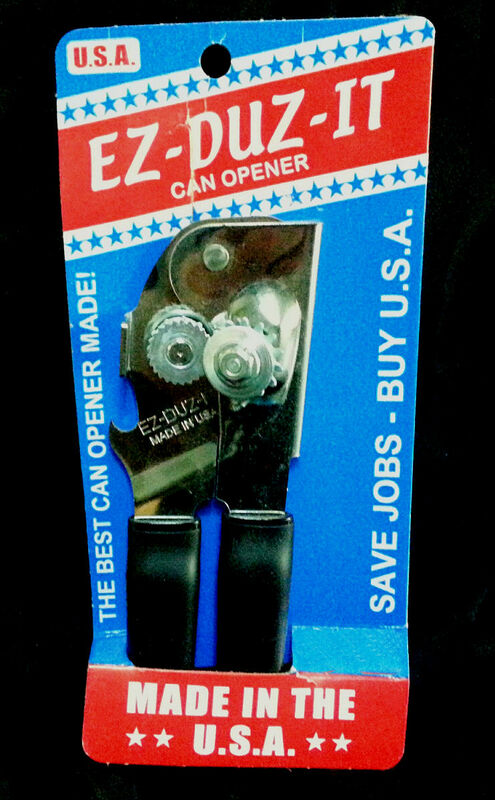 This is our 2nd EZ Duz It can opener. We ordered the red handle can opener several years ago. Still using it, but when I saw the black handle (heavy duty handles) can opener you offered, I ordered it. I really like it. It is easy to grip as I am able to open any size cans. I'm a female senior citizen with osteoarthritis in my hands. It has a nice hefty grip which suits me just fine or it would really suit either male or female hands, whatever age. Thanks Alex for offering this item on your website! Also, thanks for sending your newsletter highlighting any new products. I'm an avid fan of anything made in the USA!